In today’s society, there’s a huge misconception when it comes to suntans. Many tend to think it can make a person look young and healthy. But in reality, sunlight and especially sunburns, can be extremely harmful and damaging to your skin. Whether the repercussions are immediate or appear over time, sunburns can leave you with both cosmetic and medical damage. The most effective way to beat a sunburn is to not put yourself in the vulnerable position to get one in the first place. In a perfect scenario, we suggest taking preventative steps to ensure that your skin avoids the sun altogether. By doing so, you can keep your skin more youthful looking and minimize the potential of any permanent damage. While we recommend to err on the side of caution, we know it’s a large request to ask you to stay out of the sun entirely. Being realistic, you may forget your hat at home, sweat off your sunscreen, or overlook the importance of bringing an umbrella. We understand these types of mistakes happen. Which is why it’s important to know how to treat a sunburn, should you ever be impacted by one. Have you ever been in the sun and think you’re not experiencing a sunburn, only to notice the symptoms worsen later that night? Well you’re not alone. This is a very common mistake. The best way to reduce the symptoms of your sunburn is to stop it before it can become more severe. And, the most effective way to do this is to be continuously observant of your skin. While you’re in the sun, make sure to notice if your skin is reddening, tingling, or swelling. If you’re experiencing any of these symptoms, it’s crucial to get out of the sun immediately—before it’s too late. Some sunburn symptoms can take four to six hours to develop. So what seems like only a touch of pink in the moment, can progress into a big problem later on. By acting immediately, you’ll be able to stop your sunburn from damaging your skin in the long run. Severe sunburns bring upon severe symptoms. And many times, these severe symptoms can leave you feeling uncomfortable. We understand this. However, in order to fast-track your recovery time and reduce your discomfort, you have to take the time to correctly treat your symptoms. Follow along to learn how to treat your sunburn through moisturizers and chemical peels. Moisturizing your skin is a great temporary relief to the pain you experience during your sunburn. It helps to hydrate, sooth, and revitalize your area of impact. We recommend using aloe vera oil whenever possible. If you don’t have immediate access to aloe vera oil and are looking for a quick relief from your pain, any lotion should do the trick. In order to maximize the effectiveness of this treatment, we suggest utilizing your moisturizer immediately after a cool shower and while your skin is still damp. By doing so, the water will work to seal the moisturizer into your skin, counteracting the irritating dryness you may have from your sunburn. When you expose yourself to the sun, you’re exposing yourself to the symptoms that come with sunburns. Some symptoms come and go but others can impact your skin for the rest of your life. If you find that you’re experiencing the impact of your sunburn even years down the road, a peel may be the best solution for you. Chemical peels work to treat even your most long-lasting sun damage. However, it’s important to remember to only take part in a peel after your sunburn has healed completely. The perfect opportunity to get a chemical peel is when you notice damage on your skin after you sunburn has come and gone. At Arizona Dermatology, we offer a multitude of peels. Our top recommendation for treating sun damaged skin is our vitalize peel. It’s a powerful, yet non-damaging peel that’s safe for all skin types. Lasting twenty minutes, it works to reverse the sun damage on your skin. If you’re interested in scheduling an appointment to learn more about this treatment or any other peel, contact us today. Our friendly staff will work to meet your skincare needs. If you’re feeling any discomfort, it’s best to treat your pain right away. As soon as you notice your symptoms coming on, try taking a dose of ibuprofen, such as Motrin or Advil. This will significantly reduce the redness and inflammation that may occur. And in turn, prevent you from long-term skin damage. Another medication that’s helpful when treating your sunburn is 1% hydrocortisone cream. This cream as an over-the-counter medication that works to reduce the itching sensation you may experience from your burn. Since scratching your skin could worsen your pain or cause permanent scarring, applying a non-itch cream is a crucial step in your recovery process. Medicating earlier than later is best. However, it’s vital to always follow the instructions listed on your medication. By taking the accurate dose of medication within the prescribed time frame, you’ll allow your skin to experience maximized results in a healthy way. Since dehydration is a severe condition, it’s important to remain educated on the subject. For example, there’s a big difference between being mild to moderately dehydrated and being severely dehydrated. Being mild to moderately dehydrated is common when you’re experiencing a sunburn. Your burn is drawing fluid from your skin’s surface, which ultimately takes the fluids away from the rest of your body. You may feel as though your skin is become dry and tight. This is completely normal. You can usually reverse these symptoms by drinking more fluids. However, if you’re severely dehydrated, it’s best to handle your situation with a safe approach. Even if you have the slightest hesitation about your symptoms, we recommend contacting your doctor immediately. Your safety is our highest priority and we want to ensure that your symptoms are accurately treated. 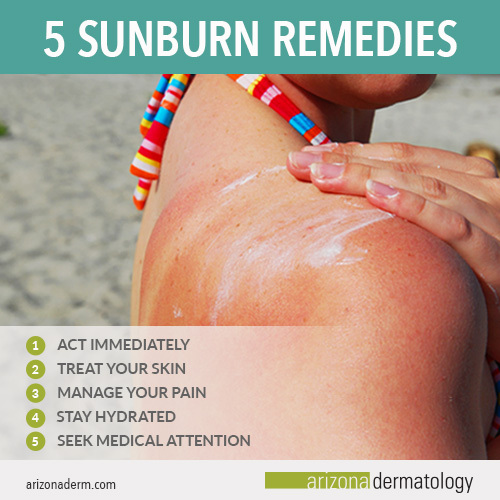 The majority of sunburns can be easily treated at home. However, if your sunburn is severe, you should seek medical attention. Your symptoms haven’t responded to at-home care or treatments. Your sun damage covers over 20% of your body. You’re experiencing chills, severe pain, confusion, or dehydration. The impacted area seems to be spreading through an infection. Red streaks are leading from your blisters. You have severe head pain or are nauseous. If you have any of these symptoms, it’s best to let a doctor treat your sunburn for you rather than turning to at-home remedies. Your doctor will be able to perform a physical examination to determine the extent of your sunburn and recommend what your next steps should be. If you have a sunburn, you should consider your burn as a warning that your sun protection has failed you. Whatever you used to protect yourself against the sun is most likely not working. Instead of being at fault to the same mistake again, vow to do better. Use dermatologist approved sunscreen, wear protective clothing, and stay out of the sun during optimal burning times. Make the necessary changes to ensure that you don’t get burned twice. If you have any questions or concerns about the symptoms of your sunburn, contact us today! Whether you’re worried about wrinkles, age spots, irregular moles, or skin cancer, we’ll be here to find a solution to your skin care needs and give you the results you deserve. Your Assurance Promise acts as our pledge to you that we will be your partners in the path to better skin, no matter what that journey may look like. join the conversation on social media! 1500 S. White Mountain Rd.